Home » Mobile Money » ZANU PF dabbling in banking and e-commerce? If you are a paid up member of the country’s ruling party ZANU PF and you have the latest version of their membership card there’s something you’ll have noticed already. 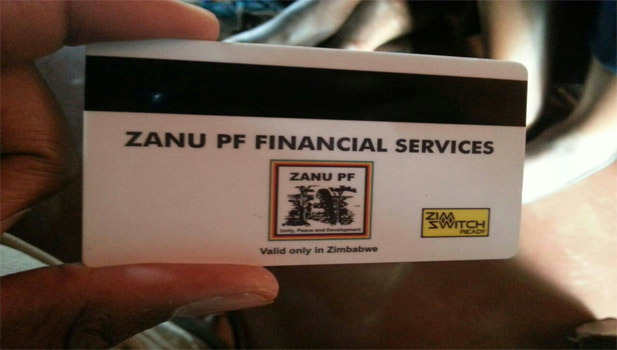 The card is written ZANU PF Financial Services and has a Zimswitch logo at the back of it. After receiving some inquiries regarding this card and its functionality we set out to establish what sort of service, Zimswitch or otherwise it was supposed to offer. Our correspondence with ZANU PF didn’t offer much detail. According to the representative we spoke to the card has “many functions” (not disclosed) that will only come to light when they have been activated. According to an individual from Zimswitch, any third party(excuse the pun) who wishes to take advantage of the financial services network has to get into a third party agreement with a bank that is a member of the Zimswitch network already. This is the sort of arrangement that Telecel had to be part of with CBZ to launch its telecash Gold Card some months ago. Zimswitch could not confirm the existence or related arrangements regarding the ZANU PF Party card/ payments card. We did however get information from another source that told us that the card is part of an arrangement with POSB. When we contacted the bank they referred us to ZANU PF to get more information on the card. So what exactly is this card meant to do? Is it a brand extension of POSB or whichever bank that ZANU PF is partnering with? Are there plans to introduce loyalty points that have cash value which party members can swipe or withdraw against? Or is this the first phase in the launch of a financial services firm or electronic payments option for ZANU PF? If you are willing to share information on the ZANU PF Membership/Financial Services Card and its payments/Zimswitch functionality please do so in the comments below. Even though the line is blurred and crossed all the time, none if this translate to Government revenue. Probably will link to your bank account and conduct monthly debit orders for $1. Why is Zimswitch partnering ZANU PF now our funds in the banks are going to stolen by Government as they now have acess to the zimswitch system. M now going to use Visa or master card only. You must be very young or very ignorant to actually write that. You’re just having a laugh, right? Right? Did u make it past grade 7? Stranger things have happened in this country. My forex disappeared from my account, during a tough time like this. Zanu doestn do logical, they do survival! As explained in the article ZimSwitch has nothing to do with this, there only rule is that any ZimSwitch enabled card must have their logo. This is a card scheme, lots of banks do it you can go to them and ask for a branded card with special functionality between card members, eg this terminal can only work with these cards. If you want the card open to the whole ZimSwitch network then you need to have their logo on it, but ZimSwitch do not have anything to do with the initiative it is handled entirely by the bank, who is happy to do it because it gets all the deposits. With the cash shortage in Zim, can this not be used to allow access to cash by political affiliation only? the idea is to encourage party loyalist to deposit their money into a certain bank(which zanu pf has partnered) and use the card to transact..i have been told that most tobacco farmers ,or farmers in general have been told to buy this card and transact using it,here is the catch..Zanu pf plans to loot the suspense account to which these account would be drawing from,and this can be easily abused. Have you requested a comment from the RBZ as the licensing authority/regulator of financial institutions? Am sure they can shed more light on what is going on here and possibly answer all the concerns above. LOL! I heard that this card will have Zero withdrawal fees, zero monthly fees and is set to revolutionise mobile money transfer. It will also have web access and USSD along with SMS alerts.